- What are Hash tables? First of all, I would like to give a big thank to this mag and to all the people contributing to the scene. Second, what is the purpose of this article? Well, throughout the following lines, I'm going to talk about optimization for collision detection and neighbor searching using a spatial subdivision structure called a hash table. As we will see, hash tables are even useful for surface triangulation, for example with the marching cube algorithm. This article will focus precisely on particles, used in physical based animations for simulating liquid flows, mass-spring systems, etc., i.e. particle systems used in many physical based effects. Only triangles will be discussed here during collision detection, but for those who prefer manipulating tetrahedral meshes for example, a very few modifications are needed. The first question is: what is the link between hash tables and particle systems? I thought hash tables were for dictionaries? That is a good question, and that's true, the link is not evident. But first of all, let me talk about the need of optimizations in collision detection and neighbor searching. Let's consider a scene of particles (or vertex) and polygons (reminder: a particle is an infinitely small point which has position, velocity, acceleration, force and mass properties, and even more). Collisions are detected if particles penetrate in an object, or even pass through it (reminder: an object is a set of triangles). Implicitly this means that for each particle, we will check its position relative to all objects. Even more, the test has to be done with all the triangles. Considering having n particles and m triangles, then the algorithm performs n*m operations, which we will note O(nm). As this might not look very impressive, you should probably have noticed the increasing number of polygons in demos, video games and all the real time processing thanks to powerful CPUs and GPUs. When dealing with millions of particles and millions of triangles, avoiding unnecessary computations is a must. So the aim of optimization techniques is to focus on particles that are in chance of getting in contact with a triangle. Let's add a little more challenge to this: some of these particles are under the influence of fluid physics. That is, fluid particles close to each other will interact with one another. Implicitly this refers to a distance test, and if this test is passed then particles will exchange some properties. In order to execute the distance check, the simplest approach is to test the position of a particle with the positions of all of the other particles. Considering p fluid particles, then the algorithm will perform p*p operations, i.e. O(p^2). Again when dealing with millions of particles, this is not a good choice. Optimization will focus on reducing the algorithm's complexity and consequently its speed. To end the introduction, this paragraph will show the structure of a physical based simulation. I will mainly use the oriented object language C++ and also pseudo code, but of course this can be adapted to other languages. As we will see later this framework will be somewhat modified. Okay, now let's answer the first question: "What is the link between hash tables and particle systems? I thought hash tables where for dictionaries?" Figure 1. Hash table example for a dictionary. How can we use that with particle systems? Or more generally speaking, with computer graphics? Imagine marble slab, wire netting, or any regular grid. If you look at them, you can see that they subdivide space. If you just could index each one of these cells ... Well, this kind of framework exists, i.e. regular 3D grids or even adaptive ones like octrees. Regular 3D grids subdivide all defined space, even where there is nothing and even where throughout the animation there will never be anything (of course then you can reduce it ...). Octrees subdivide all the defined space, more intelligently using an adaptive scheme, i.e, relative to the objects in the scene. A tree traversal is needed, but this framework is still powerful. But then, can't we just index cells where only particles and triangles stand? and anyway, what's a cell? Go back in your imagination where you were thinking of marble slab or wire netting. You can see a whole bunch of squares well positioned. Let's call these squares "cells". Now if you put your finger in a cell, you have a freedom of motion inside the cell. When you reach the borders, i.e. a line or a corner, you are about to change to another cell. Let's call these lines "discrete lines" and corners "nodes" (in fact, it doesn't have to be discrete, but it is simpler and better for understanding). Mathematically speaking, discrete numbers are integers like 1, 2, 3, 4, ... They are the nodes in the wire netting. Of course if you are thinking in two dimensions, there are integers in the horizontal and vertical axis. 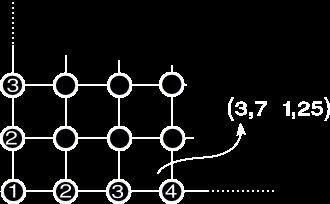 When your finger is moving inside a square, you can regard it as a floating value, which is free to move until it reaches the interval's bound (see figure 2), that is, in one dimension, considering the bounds 7 and 8, your finger is able to take all the values in between (e.g. 7.745, 7.08642, ...). So the intervals' bounds will define the cell (in 2D - square - and 3D - cube or voxel). Any value in it can be referenced by one voxel. So? If we detect a polygon and particles inside the cell, there might be a collision. If particles simulate fluid flow, then neighbors are defined by particles inside the voxel. Then the algorithm's complexity is reduced to O(nh) for collision detection where h is the number of polygons inside the cell (generally h<<m, the total number of triangles) and to O(ng) for neighbor searching where g is the number of fluid particles inside the cell (again generally g<<p). This is good! Of course it's hard to reduce it, because we have to traverse all n particles and have to check collisions with close triangles and exchange properties with close particles. We still haven't discussed how to hash, what to hash and what is the complexity of this table lookup algorithm. Figure 2. A wire netting. Hash tables in our case are not specific 3D structures, they are actually the same as the ones used for dictionaries! 1. insert all vertices into the hash table. 2. check polygons with the hash table. 3. if polygons and vertices are detected in the same cell*, collision might occur. *A little foot note here to point out that a vertex belonging to a triangle must not be checked with that triangle (always true)! This algorithm works for collision detection with multiple objects and self intersection too. Now let's look in the hash tables' machinery. Here I used an additive hash function, i.e. a * x + b * y + c * z. Use what you like most, try and test, for example a good solution is binary operators, i.e. a * x ^ b * y ^ c * z (^ = xor). The bigger the prime numbers, the better the uniqueness. In fact it happens that different cells (in space) are indexed by the same hash value in the hash table. The algorithm still runs wells, but some useless computations are done. So use big prime numbers. For example 73856093, 19349663, 83492791 to reduce non unique cases. They still happen but can be neglected due to their occasional appearance. You surely have noticed the modulo size at the end of the return. Size stands for the size of the hash tables. This is in order to keep the hash value in the bounds of the size of the tables. This can be interpreted as a grid of size tables' size that is repeated into space as the hash function respectively is 1, 2, 3, ... the size of the hash table. Once we have the hash value for a particle, in other words a reference to a voxel where the particle stands, we have to insert this particle into a list. This insertion means memory allocation and can be very expensive. Plus for each frame, or each iteration since particles move we have to reallocate the whole hash table. Of course there is a trick to avoid this. The trick here is to use timestamps. At each iteration the timestamps are incremented. When inserting a particle, we insert the timestamps as well. That way in the list, particles that have different timestamps are deprecated. When inserting, we go throughout the list from the beginning to check if there is a deprecated place. If true, replace the deprecated particle with the current one. If not, we insert it. This sort of "head" insertion will be helpful. For example, when checking particles' neighbors, if we find one that has a deprecated timestamps, then the following elements in the list are also deprecated so we do not need to check them (see figure 3). This framework means a lot of allocations in the beginning of the simulations, but still runs fairly well. Also one could simply allocate the lists of the table with the number of particles at the beginning of the simulation (always the trade off between memory consumption and CPU usage). Figure 3. "Head" insertion with current timestamps==300. When should particles be inserted into the list? Remember the big lines of physical based simulation described above. Instead of parsing all of the objects and all of their particles or vertices after the call of the move function, insertion can be done during this move function. This means giving the hash table as a parameter of the move function. 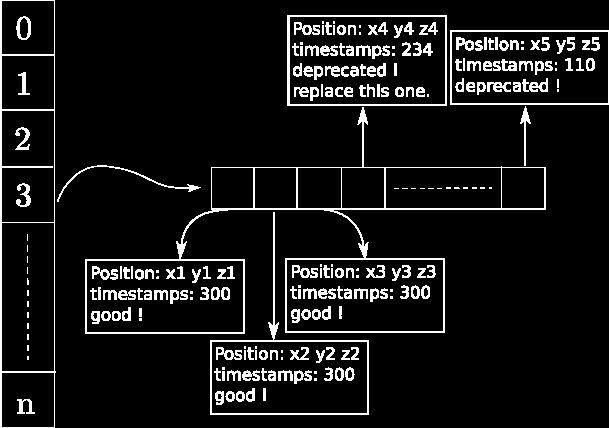 Don't forget to increment the timestamps at the beginning of each iteration. The modified structure is presented a few paragraphs under. Once we have hashed all the vertices of all objects, we need to check for collisions. Here we do not take into account edge-edge collisions, but only vertex-triangle. This paragraph will show how the hash table can be used with triangular polygons. Any extension to other kind of mesh is done here. Beware of the special case of self intersections where the vertex belongs to the triangle. Just skip this case. Our goal is to determine all the cells where the polygons stand, and for each cell detected to check a collision with particles belonging to the cell since collision might occur, with your preferred collision detection and collision response algorithms (see the flipcode tutorial  if you are not sure what to do here). Many methods can be employed like AABBox (but not optimized since it is volumetric and our triangle is planar), etc.. Triangular polygons are planar. So we only need to check along the polygons' plane and within the bound of the triangle. 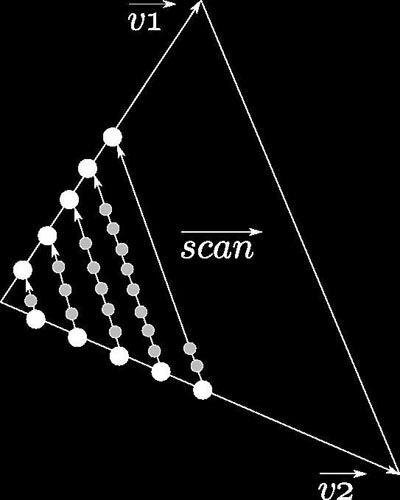 Here we propose a scanline algorithm. I call this method rasterization. // Here you have to "hash" the point tmp to find the hash value of the cell. // with your favorite algorithm. 3) for each polygon check if the cells where they stand are not empty, i.e. possible collisions. Remember that for each frame there can be multiple iterations due to time step restrictions. Generally for collisions the time step is limited to 0.01 (where you should desire 0.04 for 25 images per second), because it is easy to miss a collision if the time step is larger (i.e. the displacement is too big and specially thin objects are missed). Also some physics require small time steps due to arising instabilities. There are a few issues that should be discussed. Imagine the special case where a polygon is on a border of a cell. There is a vertex next to it, but not in the cell. That means that the vertex is near, might be involved in a collision but is not considered as a colliding point. What should be done in this case is to check the nearby cells of a polygon. Use the normal vector for the height of the polygon. It is true that there are more checks, but when dealing with millions of vertex and polygons, it is worth the case. Also, be very careful with the scanline algorithm, sometimes cells are missed. Maybe more powerful algorithms as the seed feeding should do the job. For any comments or questions about the subject, feel free to email me. There is another thing useful with hash table and space subdivision. For example fluid simulation makes use of particles to compute physics and interactions. But then there are no visible surface, just a bunch of points. So algorithms such as the marching cube can make a surface triangulation out of these particles. How? The utilized space is subdivided into cubic cells (marching tetrahedras make use of tetrahedras). A potential function is called at each of the 8 vertex of the cube; this potential function is computed using the particles in the cell and near this vertex. Having the eight functions computed, we can then define if this voxel is completely filled with a fluid, or completely empty, or is a border. In this last case, triangulation is done using the potential functions. Since it is not the aim of this article I won't go into more details about the marching cube algorithm, but you can find useful information about it on the internet. I will try to write an article on marching cubes on the next Hugi release ... ;). The good thing is that we don't need to subdivide space for this algorithm, or more precisely we have it already subdivide. We can just reuse the hash table. There are a few things I need to define before finishing. What are the good values for the cell size and the hash table size? I personally use two hash tables and two different cell sizes. One for the neighboring computations, which is the same used for the marching cube, and one for collision detection. For the neighbor computation, it is relative to the fluids' parameter, so I can't give a numeric value. It should be the size of the attractive and repulsing range. Each fluid particle is then inserted into two hash tables. For the cell size of the hash table used for collision detections, I use the average length of all edges. So I use a preprocessing step before starting simulation which computes the average length. If you use deformable meshes such as mass spring systems, then edges change length. So you are free to recompute this average length, also changing the cell size. It more computationally expensive. I personally don't recompute, just use one preprocessing and it works well. 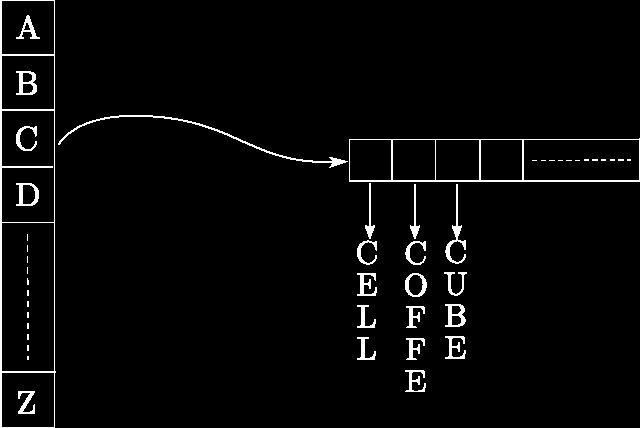 The hash table size should be around the number of primitives, i.e. the number of vertices plus the number of polygons. The best performance is found using this value. For a more test of different values, you should refer to the article . Actually, almost all that is said here comes from this paper. I hope you will find some interest reading this article, I just wish this will be useful to you one day. I personally think this method is easy to implement and powerful. One of todays' fastest methods. Of course it can be used for realtime programs (see  for time details), it handles self collisions, and useful for neighbor searching and for surface extraction. Any fluid based simulator should use this. Since it is vertex-generic, one can mix multiple meshes such as mass-spring ones, ect. Even though it took me some time to write this down, I enjoyed it, I find this mag and the demoscene amazingly full of information and creation, thumbs up to both! If you have any questions, don't hesitate to drop a mail.